One University of Washington study showed that a majority of employers are ignoring the new regulations. An industry think tank’s analysis has dubiously determined that 50% of employers “believe the law will increase their costs.” CHS talked to three Capitol Hill business owners who said implementing Seattle’s paid sick leave regulations hasn’t hurt their bottom line much at all. Everyday Music had paid sick leave before the ordinance, and manager Josh Hansen said he was glad to see the measure pass. “I think it’s gross to go to a food establishment and know that if the employees are sick that they’re not incentivized to stay home and take care of themselves,” said Molly Moon Neitzel, owner of Molly Moon’s Homemade Ice Cream. 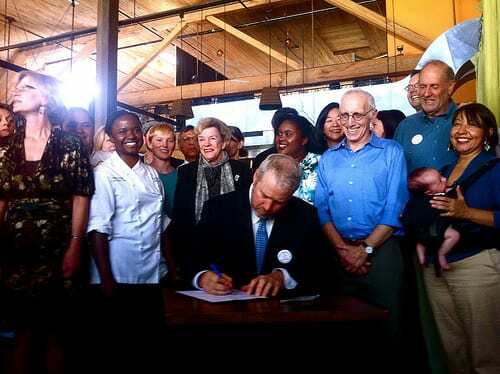 Molly Moon’s made paid sick leave available to its employees in 2011 when Seattle City Council member Nick Licata proposed the measure and the Council started to discuss it as a possibility. Local chain MOD Pizza did not offer paid sick leave to its employees before the measure passed, but Chris Schultz, vice president of operations, said the ordinance caused the company to re-evaluate its policy. MOD Pizza now offers full paid sick leave to employees at all of its stores throughout the state of Washington. “We believe it was the right thing to do, and we believe all of our employees should have the same benefit,” Schultz said. Both Schultz and Neitzel said they haven’t seen significant effect from offering paid sick leave to their employees. “We haven’t seen a dramatic impact to our bottom line,” Schultz said. “My employees rarely use it,” said Neitzel. If employees are comfortable in their working environment they will be less likely to abuse the policy, Schultz said. As for the estimated 65.4% of businesses that do not offer paid sick leave to their employees? “I want to know what those businesses are so I don’t go eat there,” Neitzel said. If it’s that high of a percentage of businesses that aren’t offering it, then I think it’d be easier to make a list of the ones that do, because, yeah, I don’t really want to give them my money.